“Sanjay’s Super Team” emerged the victor in this week’s poll, which I’m very happy about! I’ve been waiting to delve back into this short ever since we launched our short film series. Premiering before The Good Dinosaur in 2015, it was met with unanimous praise and approval. Inspired by director Sanjay Patel’s childhood, this mostly true story wasn’t, at first. Patel was actually very reluctant to make it a personal film, but some encouragement from both his father and John Lasseter prompted him to shine the spotlight on his younger self. “Sanjay’s Super Team” is not only Pixar’s first film with a nonwhite protagonist, but the first to feature a non Western culture as well. There are two rituals being practiced in this short. One is sacred while the other is a distinctly American pastime. Sanjay and his father sit on opposite sides of the room which further illustrates the contrast between their two activities. Note how the television and prayer box are the same shape, the antennae mirroring the incense sticks. Also note how Sanjay is on the left (West) side, while his father is on the right (East) side. The boy runs to the television set and gleefully begins watching his favorite superhero cartoon. His father is quiet as he kneels before his prayer box. He rings a bell which signals to Sanjay that it’s time to pray. The boy ignores him and instead raises the volume on the TV. But his father has the remote, and he turns the TV off and takes away his son’s action figure too. A thoroughly uninterested Sanjay joins his father, sighing about the whole ordeal. He sneaks the toy back from under his father’s nose and its cape accidentally catches fire from the flame in the oil lamp. Sanjay ends up blowing out the flame and is transported to a cavernous temple. Sanjay is all alone in this dark, cold place, until a monster unfurls from the giant oil lamp in the center of the temple, a creature made of darkness. The monster proceeds to destroy the temple. Sanjay lights the oil lamp, and three Hindu gods come to life: Vishnu, Durga, and Hanuman. Now the temple is filled with both light and warmth. The deities evoke tranquility in the midst of chaos. They attempt to quell the monster’s attacks, but only succeed momentarily. It’s up to Sanjay to restore peace, and he does so by smashing his action figure against the oil lamp. The reverberating echoes, not unlike the ringing of his father’s bell, calm the monster and he departs peacefully. As the older Patel remarked, the monster is a metaphor for little Sanjay’s own chaotic energy. His father also wanted him to be calm. And when little Sanjay is finally still, he reaches enlightenment, much like the monster who ceases his destruction of the temple. Sanjay receives a blessing from Vishnu, along with his repaired toy, and returns home. His father allows him to watch TV again once he sees that the boy has no interest in his customs. But Sanjay now has a much better understanding – and appreciation – of his father’s religion and beliefs. Although “Sanjay’s Super Team” lacks dialogue, it’s a symphony of sounds, as well as light and color. Mychael Danna’s score achieves an epic and adventurous sound, that blends in seamlessly with the chimes of both bells and light. The short’s bold designs and lighting also sets it apart from other Pixar features. The light behaves much differently than it would normally. There’s a glossy sheen to the light and textures within the temple, making the deities almost appear translucent. 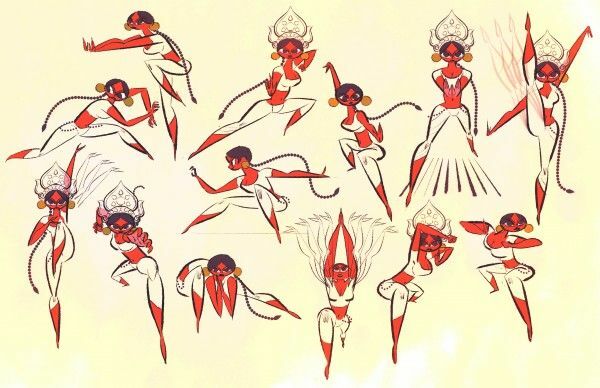 There’s also a gracefulness to the short, evident in the movements of the deities. That was a result of studying Indian dances, such as Bharatanatyam, Odissi, and Kathakali. But there’s gracefulness in the narrative too. The story grew from Patel’s own experiences of ignoring his family’s culture and instead gravitating to an American one. He didn’t want to be different at all. 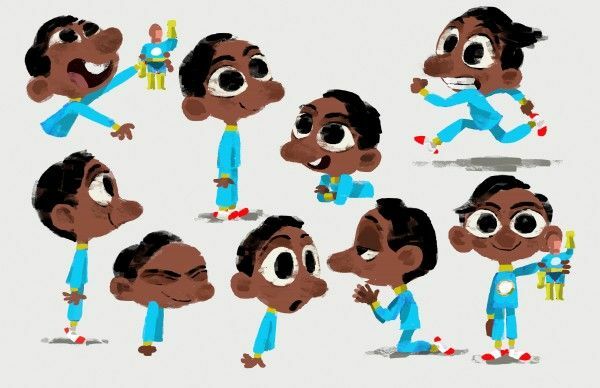 “I wanted my name to be Travis, not Sanjay.” So the short’s conclusion, in which he envisions the deities as his own superheroes and proudly shows his artwork to his father, is especially touching. Sanjay realizes that he can unite his passions and his father’s traditions, that he can embrace his Indian heritage and his American one. “Sanjay’s Super Team” is not only a gift for Sanjay Patel’s younger self, but for the audience as well. Sanjay doesn’t have an age – at least his older counterpart doesn’t know how old he actually is! The kid art in the end credits was drawn by the children of Pixar employees. Vishnu, the blue deity, represents Sanjay’s father. He’s known as the preserver, and that’s what Sanjay’s father did with his traditions. 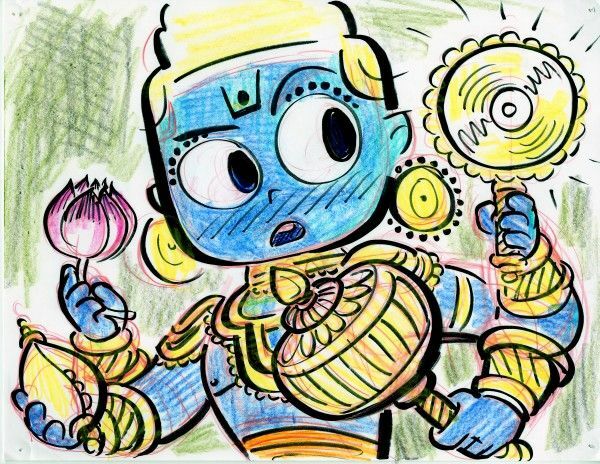 Vishnu’s blue color is also central to the short, as the flame is blue and so are Sanjay’s pajamas. The motel that Patel’s parents managed is also the same one in the short. One of the best things about Pixar is their commitment to innovation. We’ve been highlighting the studio’s short films recently, which have been part of its DNA since it was founded over 30 years ago. That legacy continues with their latest project. Yesterday Pixar revealed their new SparkShorts program – an official title for the experimental shorts department that we found out about in 2017. It was already an exciting concept – for years, Pixar shorts have been a way of trying out new things and giving employees a chance to try their hand at directing. Having a whole internal program dedicated to giving people at Pixar – from all sorts of different backgrounds and departments – the opportunity to create with little to no restriction or pressure is ingenius. It’s what Pixar is all about: encouraging and inspiring creativity. “Diversity and inclusion are at the heart of SparkShorts. The program was created to provide opportunities to a wide array of artists – each with something unique to say.” – Lindsey Collins, vice president of development for Pixar. The first three shorts in the SparkShorts program will be shown at the El Capitan Theater following The Little Mermaid this January 18th-24th. After this, the shorts will even be available on YouTube for us all to see. Pixar have published the titles and descriptions of these three shorts which you can read below. Just months after Domee Shi became the first female director at Pixar for her memorable short “Bao”, it’s so encouraging to see more female directors and new talent from all sorts of different backgrounds making their debut. It’s exciting. We’re looking forward to the new shorts, and to the future! There are countless stories waiting to be told by the talented employees at Pixar, and with projects like this going on, we’ll actually be able to hear them! You can now find out more about each of the SparkShorts on Pixar’s site here. They’ve also released each short’s corresponding poster. “Loop” and “Wind” are my personal favourites, but they’re all very cleverly designed. It’s already clear that having crews of diverse storytellers and animators has led to these SparkShorts connecting with a wider range of underrepresented communities and cultures: praise has been given to “Float” for being the first Pixar short to feature Filipino characters, and “Loop” will feature Pixar’s first non-verbal autistic character ‘Renee’, who can be seen in the poster.